In all of my years of stamping, I have never made a magic card : ) The AOSA (About Oriental Stamp Art) Yahoo group had a challenge this month, and I just had to try it! This is also for Day 1 of the 30 day coloring challenge. Image is I Brake for Stamps The DP is G45 Bird Song. Shelly, that is incredible...I have never seen anything like that. That stamp is gorgeous also. Have a wonderful holiday weekend. I think those magic cards really are magic! I love the gorgeous image and papers you chose. Your card is very elegant. I love this technique, although I never tried it. You did a nice job with it. 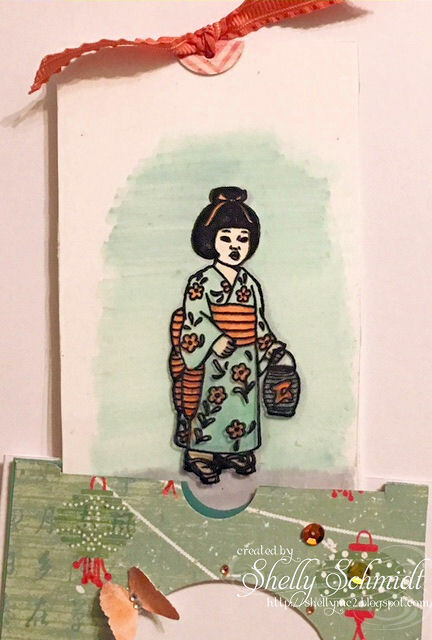 Very cute geisha and designer paper. Such a cute interactive card! I must check out the tutorial. Thanks for providing the link. Oh Shelly this is gorgeous! I have been meaning to try this and love your take on the magic card! What a fabulous card Shelly - love the 'magic' element to it! So awesome!! I love this fabulous card, Shelly!! Up comes one little hurricane and look at all I missed! I have certainly enjoyed catching up on your latest creations this morning!